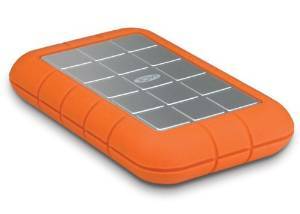 The LaCie Rugged Triple Hard Disk provides universal connectivity: you've got the superior speeds of USB 3.0 and FireWire 800, and full backward compatibility with FireWire 400 and USB 2.0. You can transfer a 700MB video file in less than 7 seconds with USB 3.0, compared to 25 seconds with USB 2.0 With the Rugged Triple's 7200rpm model, you can even achieve speeds up to 110MB/s. Additionally, you can use the LaCie Mac USB 3.0 Driver to improve data transfer speed on your Mac (up to a 30% performance increase compared to FireWire 800). Whether your goal is super speed or complete compatibility, the Rugged Triple has everything you need. The Rugged is one of our most popular hard disks, and it's the best way to protect your data. It conforms to military standard 810-F, and can support drops from up to two meters. It helps you carry your files with confidence, no matter where the road takes you, thanks to its shock-absorbing sleeve, aluminum anti-scratch casing, internal rubber bumpers, and a 1000g shock-resistant hard drive. Calculations are based on average read time. 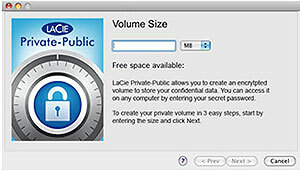 LaCie AES 256-bit encryption software comes standard with the Rugged Triple. We've made it easy for you to create a password-protected area on your drive where you can securely store all of your confidential information. AES 256-bit encryption technology is one of the most robust on the market today, and makes the Rugged Triple more secure than ever. The Rugged Triple also offers easy setup and automatic backup on both PC and Mac computers. It also features an automatic Eco mode that lowers the power consumption by up to 40% when not in use, increasing the battery life of your notebook. In addition, you get 10GB of Wuala Online Storage included for one year to securely store and share your data online. 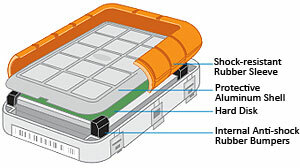 The LaCie Rugged Triple Hard Disk provides universal connectivity: you've got the superior speeds of USB 3.0 and FireWire 800, and full backward compatibility with FireWire 400 and USB 2.0. 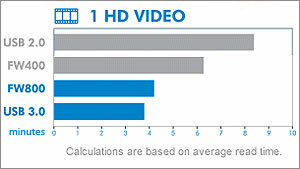 You can transfer a 700MB video file in less than 7 seconds with USB 3.0, compared to 25 seconds with USB 2.0. Additionally, you can use the LaCie Mac USB 3.0 Driver to improve data transfer speed on your Mac (up to a 30% performance increase compared to FireWire 800). Whether your goal is super speed or complete compatibility, the Rugged Triple has everything you need. The Rugged is one of LaCie's most popular hard disks, and it's the best way to protect your data. It conforms to military standard 810-F, and can support drops from up to two meters. It helps you carry your files with confidence, no matter where the road takes you, thanks to its shock-absorbing sleeve, aluminum anti-scratch casing, internal rubber bumpers, and a 1000g shock-resistant hard drive. LaCie AES 256-bit encryption software comes standard with the Rugged Triple. The Triple makes it easy for you to create a password- protected area on your drive where you can securely store all of your confidential information. AES 256-bit encryption technology is one of the most robust on the market today, and makes the Rugged Triple more secure than ever. The Rugged Triple also offers easy setup and automatic backup on both PC and Mac computers. It also features an automatic Eco mode that lowers the power consumption by up to 40% when not in use, increasing the battery life of your notebook. In addition, you get 10GB of Wuala Online Storage included for one year to securely store and share your data online. LaCie Rugged Triple Hard Disk, USB 3.0 cable (USB 2.0-compatible), FireWire 800 cable, Quick Install Guide. Dimensions (WxDxH): 90 x 28 x 145 mm / 3.5" x 1" x 5.7"